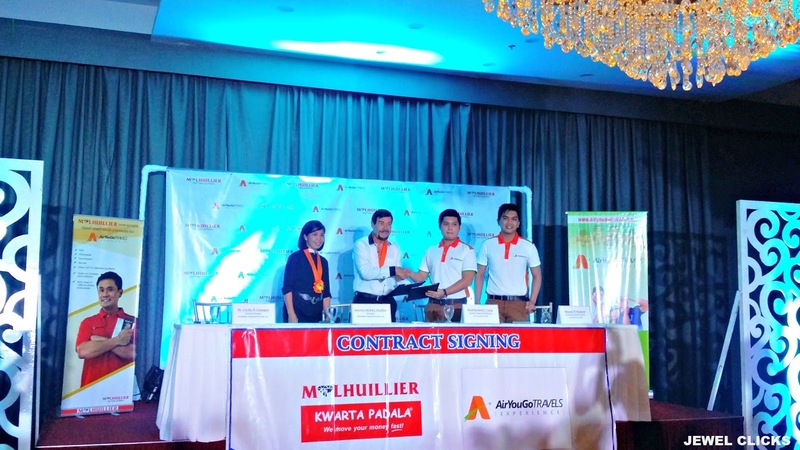 Mr. Michel Lhuillier, MLhuillier Pawnshops Owner (second from the left) and Mark Kenneth Iverson Calog, Air You Go Travels Co-Founder (second from the right) and Rhamric Peñola Simpron posed during the signing of partnership agreement of the two companies in Cebu Mandarin Hotel. Yup! Air You Go Travels organized our entire trip. When I saw their ads on facebook, I got hooked and shared it to my friends, right away and perfect because they are Travel Agency based in Cebu. Despite on our busy schedules that time, my friend and I went to their office to pay our down-payment. Though they have this bank deposit options, I am sure you don't want to wait for hours while waiting for your turn and you will just choose to drop by their office to send the full payment and just deal with traffic. This is good news to all their customers and potential clients nationwide! You can now process your payments through ML Kwarta Padala Bills Payments in any of their over 1900 branches nationwide. A service fee of PHP 20 will be charged per P50,000 transaction. BOOK AND FLY RAFFLE PROMO! Wow! nice kau ni Jewel! Now traveling is so much easier!!! !